Governments define strategies in order to transform their political missions to reality, deal with various challenges, schedule public spending, and control public investments. This phenomenon occurs even at supranational levels, where governments negotiate and agree on common objectives, which comes close enough to competitive political interests. Government strategic planning is crucial and defines necessary strategic elements such as vision, mission, success factors, stakeholders, etc. Moreover, strategic planning is a continuous process, since strategic updates follow previous plans and recognize existing successes and failures. Strategic implementation occurs via framework programs, which allocate funding on alternative priorities, while they identify methods for strategic assessment and monitoring. 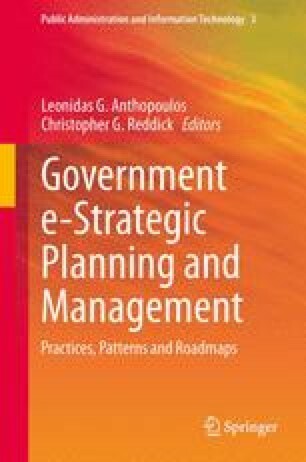 This chapter focuses on government e-strategies and aims to illustrate whether program evaluation can result in the assessment of strategic transformation. In this context, existing program evaluation methods are compared according to their applicability on strategic transformation’s evaluation. This comparison will be applied on data from Greece, where three government e-strategies have been evolved since late 1990s and respective framework programs have been implemented. Bachtler, J., & Taylor, S. (2003). The added Value of the Structural Funds: A Regional Perspective IQ-Net Repοrt on the Reform of the Structural Funds. EPRC, University of Strathclyde, Glasgow. Retrieved May 2013, from http://www.eprc.strath.ac.uk/iqnet/downloads/IQ-net_Reports(Public)/IQ_Net_Added_Value.pdf. European Commission. (2010a). The Lisbon Strategy 2000–2010. An analysis and evaluation of the methods used and results achieved. Directorate General For Internal Policies. Policy Department A: Economic and Scientific Policy. Retrieved March, 2013, from http://www.europarl.europa.eu/document/activities/cont/201107/20110718ATT24270/20110718ATT24270EN.pdf. European Commission. (2010b). EUROPE 2020: A strategy for smart, sustainable and inclusive growth. Retrieved March, 2013, from http://ec.europa.eu/eu2020/pdf/COMPLET%20EN%20BARROSO%20%20%20007%20-%20Europe%202020%20-%20EN%20version.pdf. European Commission. (2005). Guidelines of project/programme evaluations. Retrieved May, 2013, from http://ec.europa.eu/europeaid/evaluation/methodology/egeval/guidelines/gba_en.htm. European Commission. (2004a). Εx-Ante Evaluation, a practical guide for preparing proposals for expenditure programmes, December 2001 European commission, Benchmarking Enterprise Policy: Results from the 2004 Scoreboard, Brussels 2004. Retrieved, May 2013, from http://www.mfcr.cz/cps/rde/xbcr/mfcr/DGBud_Evaluation_Ex-ante_Guide_2001.pdf. European Commission. (2004b). Evaluating ΕU Activities, a practical guide for the Commission services, Brussels 2004. Retrieved May, 2013, from http://ec.europa.eu/dgs/secretariat_general/evaluation/docs/eval_activities_en.pdf. European Commission. (2004c). Overview of Evaluation Guides in the Commission, Brussels 2004. Retrieved May, 2013, from http://www.mfcr.cz/cps/rde/xbcr/mfcr/DGBud_Evaluation_GuidesOverview_2004_pdf.pdf. European Commission. (1999a). Methodological Working Paper No. 2 for the 2000–2006 Programming Period: The Ex Ante Evaluation of Structural Funds Interventions. Retrieved May, 2013, from http://ec.europa.eu/regional_policy/sources/docoffic/working/doc/exante_en.pdf. European Commission. (1999b). Methodological Working Paper No. 3 for the 2000–2006 Programming Period: Indicators for Monitoring and Evaluation: An indicative methodology. Retrieved May, 2013, from http://ec.europa.eu/regional_policy/sources/docoffic/working/doc/indic_en.pdf. Fitzgerald, J., Kearney, I., Morgenroth, E.,& Smyth, D. (1999). National Investment Priorities for the Period 2000–2006. The Economic and Social Research Institute, Dublin. Retrieved May, 2013, from http://ideas.repec.org/b/esr/resser/prs33.html. Greek Ministry of Finance. (2010). Digital Planning Public Consultation results (in Greek). Retrieved September, 2011, from http://www.opengov.gr/ypoian/wp-ontent/uploads/2010/05/apodeltiosi_ps__v2_0.pdf. Greek Observatory. (2011). Digital Literacy in Greece compared to EU27 2007–2010 (in Greek). Retrieved May, 2013, from: http://www.observatory.gr/files/press_releases/PR_110714_%CE%A8%CE%B7%CF%86%CE%B9%CE%B1%CE%BA%CF%8C%CF%82%20%CE%91%CE%BB%CF%86%CE%B1%CE%B2%CE%B7%CF%84%CE%B9%CF%83%CE%BC%CF%8C%CF%82.pdf. Greek Special Secretary for Digital Planning. (2006). Digital Convergence (in Greek). Retrieved May, 2013, from http://www.digitalplan.gov.gr/resource-api/dipla/contentObject/3488695f-ea80-4f4f-9982-151d940dadd2/content. Greek Special Secretary for Digital Planning. (2006). Digital Strategy 2006–2013 (in Greek). Retrieved May, 2013, from http://www.infosoc.gr/NR/rdonlyres/A13F889F-DE92-4DCF-B64A-37351BFC69B9/3053/ktp_all.pdf. Greek Special Secretary for Digital Planning. (2004). Annual Ex-Ante Evaluation Report for the Greek Information Society (in Greek). Retrieved May, 2013, from http://www.infosoc.gr/infosoc/el-GR/epktp/Parakoloythish_ajiologish/DiadikasiesAjiologhshs/exante/. Greek Special Secretary for Digital Planning. (2004b). Annual Mid-term Evaluation Report for the Greek Information Society (in Greek). Retrieved May, 2013, from http://www.infosoc.gr/infosoc/el-GR/epktp/Parakoloythish_ajiologish/DiadikasiesAjiologhshs/EndiameshAjiologhsh. Tavistock Institute. (2003). The Evaluation of Socio-Economic Development, The Guide. London 2003. Retrieved May, 2013, from http://www.pol.ulaval.ca/perfeval/upload/publication_151.pdf.